Batman: Arkham Knight, Uncharted: The Nathan Drake Collection, Dying Light: The Following, Mortal Kombat X, and more available at a new low price starting next week. I’m happy to announce that we’re adding more incredible games to the PlayStation Hits lineup on November 2 in the U.S. and Canada. For those of you that missed it the first wave, PlayStation Hits is a collection of great PlayStation 4 games at a great price. 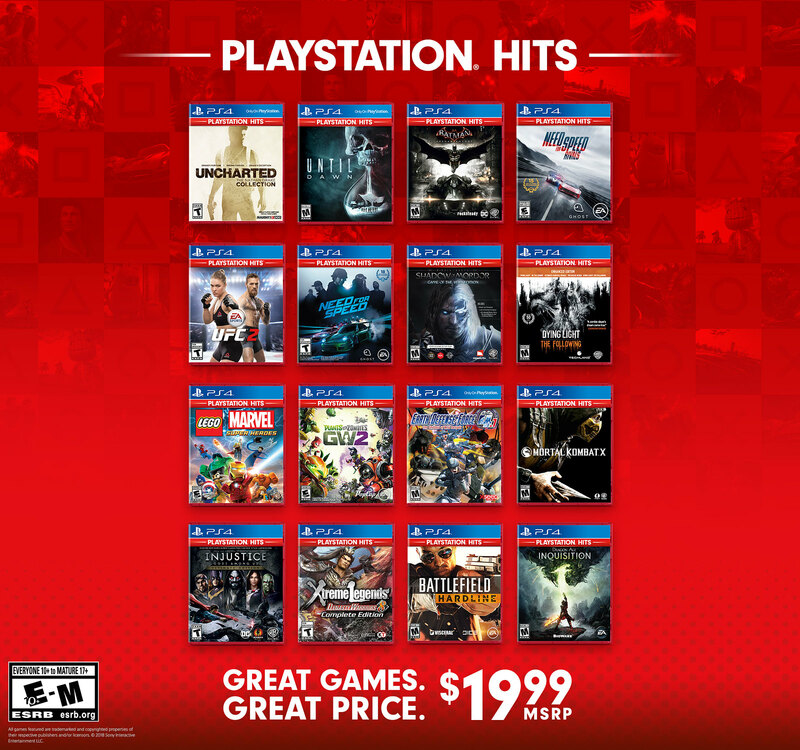 From award winning epics to family friendly favorites, PlayStation Hits is a fantastic way to catch up on some iconic PS4 games for $19.99 USD (MSRP) on PlayStation Store for download and select retailers across the U.S. 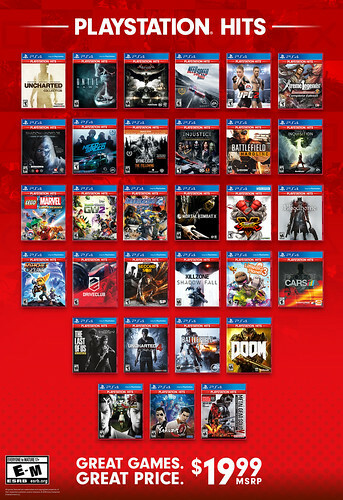 In Canada, select titles are available at participating retailers and PS Store, and the games will range in price. PlayStation Hits are also easily recognizable, as they each feature a unique red packaging instead of the usual blue. Check out this page for the full lineup in Canada. We’ll be sure to keep you posted on new and exciting games that we continue to add to the PlayStation Hits lineup. In the meantime, let us know which games you’ll be picking up in the comments below! EDF! EDF! EDF! If anyone reading this enjoy’s local/online coop games and hasn’t tried EDF4.1 yet, DO IT! I feel like Helldivers Super Earth Edition for PS4 should be part of Greatest Hits. Maybe next year? Also, the user suggesting the PS Store should have a section for PlayStation Hits to be able to quickly find these is spot on. If you never played an Earth Defense Force game before and always wanted to be in a Godzilla movie with crazy weapons and co-op. Now is the time! Very fun game. Shadow of the Colossus kinda joined it too as it’s official base price dropped to 19.99. So who decided to put X instead of XL? Will the vita version of DW8 be cheapened as well? I thought need for speed was shut down. Every time lately when I try to play it will not go past the main screen. Will not find server. one, the canada page links to the old lineup with no new titles. professional as ever to tell me to click for full canada lineup and waste my time. the sony editions are baseline $20 for quite some time and are on sale much lower with regularity. While good games having the ugly red stripe for same or more than old boxes and much worse than $5-8 sale on the high end feels a bit sleazy. these are rhe best of the bunch. the rest appears to be a mix of old EA and WB launch games and cast offs they have been flogging for years. some could be compelling if they were dlc complete like batman and mk x, are not compelling. when WB feels it cannot flog dlc it has kept shadow of mordor and dying lite the dlc enhanced editions. not the case with EA the need for speed games not being complete editions show their utter greed, especially the launch title that absolutely you want to get the complete edition for as base wise it’s engineered to waste your time. Look at the EA titles and ask why are these being promoted. it’s embarrassing. I won’t be buying any. MGS5 complete was the bar, and this fails. Not to mention Canada was arbitrarily excluded from the other real deal in doom last go. Not to come off as rude here but you could really do more for new customers the the brand than EA and WB pretender sales. what’s next call of duty ghosts and assasin’s creed 4 greatest hits. A missed opportunity for greedy corporate partners. finally, knowing in canada some titles are arbitrarily juiced to $29.99 significantly more than actual exchange rate, this will leave many of us here underwhelmed. Well theres a bunch of nintendo games coming out now that i have RDR2. Why not including the GOTY editions of the games? Who will buy Mortal Kombat X? Only to collect red cases. Se tiver Dark Souls 2 ou o 1 HUMILDE! !